Chef Kevin Mitchell had a successful career in the food industry that included restaurants, catering, hotels, and universities. So the next logical step was to teach others to follow in his footsteps. Now in his third year at the Culinary Institute of Charleston, he shares what it’s like to teach culinary students. 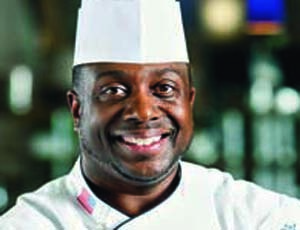 BlackEnterprise.com talked with Mitchell about why he decided to share his knowledge and the career opportunities available to those with talents in the kitchen. How did you become a chef instructor? Teaching was something I always wanted to do. I felt it would be an inspiration for the students to see an African American guy doing good things in the industry. Being an instructor offers a really great quality of life compared to the 80 hours I was used to working. My last job before I became an instructor, I ran a 600-seat restaurant, where I managed six chefs and about 85 cooks. As an instructor, it’s myself and 16 students. So the pace, for one, is a lot slower. And I wanted the opportunity to give back to future chefs. I get here at 7 and I have office hours so I’m in the office preparing for class, going over my lesson plans, going over the recipes, going over all the food orders for each class, and also waiting for students to come in that may have questions. At 9:30 when I go into class, we do lecture. And then once lecture is over we go through the recipes and I explain to each of the students what they’re going to produce for the day. And from there we actually go to the kitchen and then they start doing all their prep and getting all their ingredients together. From that time until the end of the class my day is spent walking around the kitchen student-to-student working with them as they’re progressing through their recipes and fielding any questions or just putting out fires like a chef would normally do in his kitchen. What types of classes do you teach? Yes, I teach American regional cuisine. I teach international cuisine. I tech an introductory class called Intro to Culinary Arts. That’s a lecture class where we get the students into an amphitheater and we discuss the job of being a chef outside of cooking–getting them to understand what the industry is all about. I’ve also taught a garde manger class, a class that’s centered around cold food preparation. And then I also teach what we call a skills class. That class is where the students first get into the kitchen and learn about basic culinary preparation. What are the career options available for those coming out of culinary school? Mitchell, along with other food industry professionals, will be profiled on BlackEnterprise.com throughout this month, in conjunction with Black Enterprise magazine’s November 2011 “A Passion for Foodâ€ issue. Check out the latest features on industry heavyweights, including Marcus Samuelsson and The Neelys, on newsstands now.